These five-day retreats are ideal for anyone who would like to explore the ancient Chinese self-care systems of Qigong and Tai Chi. These are both moving meditations based on slow movements and conscious breathing techniques. The retreats are held at Erve Veldink, a lovely course center based in an old farmstead with a history that goes back to the 14th century. Erve Veldink has been running and hosting self-development courses for the last 35 years. The center is in a peaceful, green setting in the eastern part of the Netherlands, not far from the German border. There is ample time during the retreat for walks in the countryside. During this retreat, you will be staying in a renovated farmhouse, which is built in the 1800s. Standard accommodation will be in a shared dormitory. Options of double rooms (also for single occupancy) and either shared or single accommodation in one of the holiday flats are also available. Experience a relaxing and inspiring five-day retreat exploring the extraordinary world of Taoist mind and body practices. A fully-qualified instructor leads qigong, tai chi, and Taoist meditation sessions every morning and afternoon in a group yurt. Introduction to traditional Chinese healing herbs, Taoist diet and nutrition, as well as basic acupressure techniques are also included. There will be at least one evening session with a local flair such as a live performance of Swedish folk music. Guided walks in the stunning, natural setting of Flatön and, optionally, renting a kayak for a day on the water are some of the nature-based activities available. The hot tub and wood-fired sauna are just the thing for a contemplative and rejuvenating time. There will be at least one evening session with music and tales. If the weather permits there will be an afternoon excursion to a local forest. Stephan is a fully-certified integral Qigong and Tai chi teacher, Taoist author and practitioner, and the co-founder of the Greenstones eco-retreat company in Sweden. He has been practicing Qigong for over 20 years. He is also a choral director and a trained musician who plays jazz bass, Irish and Scottish folk guitar, and the mandola. He ran his own information technology business for many years, working for Apple and Adobe, so he knows all about stress and ways to deal with it. 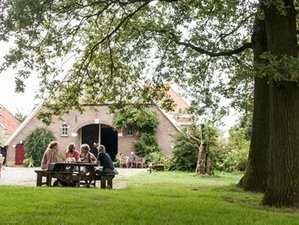 The retreats are held at Erve Veldink, a lovely course center based in an old farmstead with a history that goes back to the 14th century. Erve Veldink has been running and hosting self-development courses for the last 35 years. The center is in a peaceful, green setting in the eastern part of the Netherlands, not far from the German border. All three daily meals are included in the price of this retreat. You will be served healthy vegetarian meals prepared with organic produce and ingredients that are locally sourced whenever possible. Herbal teas, delicious water from the deep well, and coffee are also provided. The meals are prepared in accordance with whatever dietary requirements you may have, so please advise Greenstones well in advance of your specifications. Massage and craniosacral sessions available at an additional cost. The nearest airports are Amsterdam Airport Schiphol (AMS) and Düsseldorf International Airport (DUS). The nearest train station (Ruurlo) is about two and a half hours from both. A taxi costs about 30 EUR to Erve Veldink from the train station. We offer retreats in a beautiful, peaceful setting to make Qigong and Tai Chi enjoyable and accessible for everyone.